Color consistency for injection molded parts poses a challenge. This becomes apparent for mating parts in any assembly where colors usually need to match 100%.Additionally some production batches may require stringent color consistency. This guide explains how to choose the right techniques by making you aware of the challenges that each coloring option poses. If you plan to produce your parts in a plastic injection mold and you are going for low volume production, you need to decide between color consistency and achieving custom colors for your parts. If you plan to produce higher volumes (above a ton of material) then color consistency for custom colors is not a big issue. Depending on your situation you may then follow the below guidelines. Choose a predefined color Usually Pantone® or RAL colors are a good place to start. Assure raw-material availability Please keep in mind that not all RAL and Pantone® colors materials are available. Given that we can order the right material for your desired Pantone® or RAL color, we can achieve fairly consistent color matching per batch. In between production batches you may face slight color alterations, but they are insignificant. There are cases where parts need 100% color matching – for example in an assembly. Two techniques allow you to achieve that: molding in a family mold or painting. You can theoretically put two different components into the same mold – this is called a family mold. The components are therefore molded from the same batch of raw material. This gives you the same color for both parts. This technique may prove difficult when the two components differ in their geometry. For this purpose sequential valve gating is required. The cost of this type of hot runner system is higher. For small batch productions this is not economically viable. Painting after molding can be considered as another option. Subsequent scratching will have a minimal visual effect, if the part is molded in a color fairly close to that of the paint. Components with similar geometries can be made in a family mold and achieve 100% color matching. Components with different geometries may require sequential valve gating, which is more expensive and economically suited for larger production volumes. Painting of parts is the last option and ensures color consistency but also adds to the cost. There are three types of options to achieve custom coloring. For low-volumes, only the first option (using pigments in the hopper) makes economic sense but color consistency is virtually impossible. Further explanations for the interested reader is given below. Using compound custom material, or using a master batch colorant, allows color consistency within batches, but these techniques are only suited for larger production volumes. They are described in a separate section below. A colorless granulate is mixed with pigmenting powder in a rotating drum. The only force keeping the two components together is of electrostatic nature. The nature of the process therefore does not allow 100% consistent coloring of the granulate. The material is then filled into the hopper. Pigmenting powder is naturally very thin. When heating it up with regular plastic granulate it sometimes causes burning of the particles. The powder then turns into black carbon oxide. When injected, the parts might be sprinkled with tiny black spots. Engineering plastics need to be dried in a desiccant dryer before being injected. The pigment must be added after drying. The granulate material absorbs some moisture during this delay, which causes the material properties to change. Furthermore handling problems with a material at elevated temperatures causes complications in the process. When you manufacture thousands or up to hundreds of thousands of units, then achieving consistent custom colors becomes less of a problem. There are two different approaches achieving custom coloring for your parts: pre-mixed or compounded material and mixing a master batch with uncolored plastic. Both options are explained below. Custom compounded material can be purchased from a supplier. The material is then injected into the mold directly. A minimum tonnage of at least a ton of material needs to be purchased on the open market so this process is economically less suitable for low-volume production. Usually color consistency is good but there are slight variations from batch to batch. Custom colors can also be mixed in the injection-molding machine. Two materials need to be mixed in order to create the final material: the masterbatch colorant and the uncolored plastic pellets. The masterbatch is a pre-fabricated colorant. The masterbatch is a colorant of high pigment density which is mixed with the raw plastic in the hopper and injected. The mix ultimately creates the final custom color. The reason that this approach is only suited for high-volume production is due to the mixing ratio of natural material and masterbatch colorant. 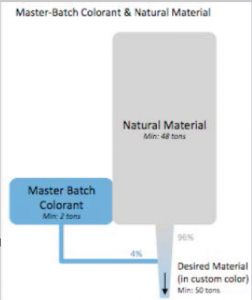 For 96 units of natural material, only 4 units of masterbatch colorant is needed. 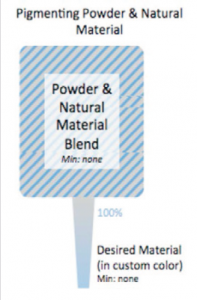 The minimum order quantity of masterbatch colorant is two tons. 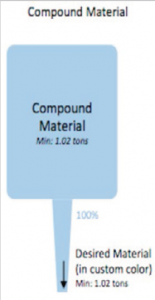 Ultimately this results in a minimum of 50 tons of final material for manufacturing. Figure 5 graphically explains this calculation. The process is similar to the one described in 3.1 but now the blending is taking place inside the machine. This process allows much higher volumes at a lower compounding cost per kilogram. Color variations within the batch are fairly stable, but as in the previous case, there will be deviations from batch to batch. Regardless of the coloring method used, if 100% color matching is required the parts must be molded at the same time in the same mold (family mold). Variations will be apparent from batch to batch but as the parts are molded in the same mold they will match in each individual assembly. If you’d like to discuss your next project with one of our experts, send us your CAD file for a free quote and design review.